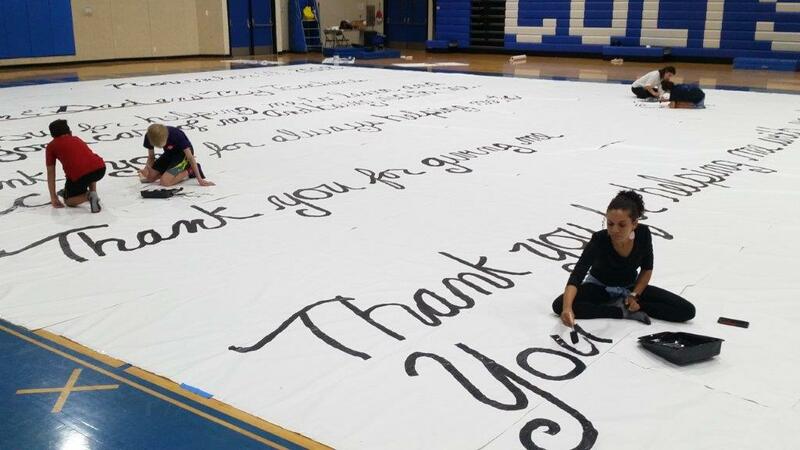 The creation of “The World’s Largest Thank You Letter” is part of celebrating the first “National Thank You Letter Day.” Taking place one week before Thanksgiving, National Thank You Letter Day is to remind us of the simple and powerful act of sending a letter of thanks to someone we care about or love that has affected our lives. Carew created the letter and the day to teach children—and remind adults—about the timeless importance of saying thank you through handwritten letters. Not only does he want to inspire in children that “Thank You” letters are still important in our culture but that believing in kindness and manners, civility and gratitude, still matter in the world, and that thank you letters are a vital way to communicate these beliefs. Carew likes to create big, memorable, “teachable moments” that will inspire kids for a lifetime. With this event, he is creating an opportunity for community togetherness that will teach kids about the importance of thanking others and being thankful in their daily lives. When: On National Thank You Letter Day—November 14, 2018. 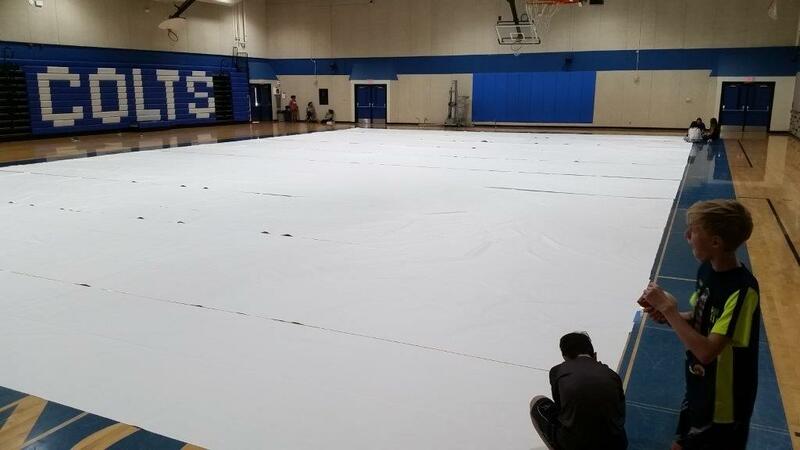 The letter will be officially rolled out on the gym floor in front of the entire school for the “Thank You Letter Day” assembly. 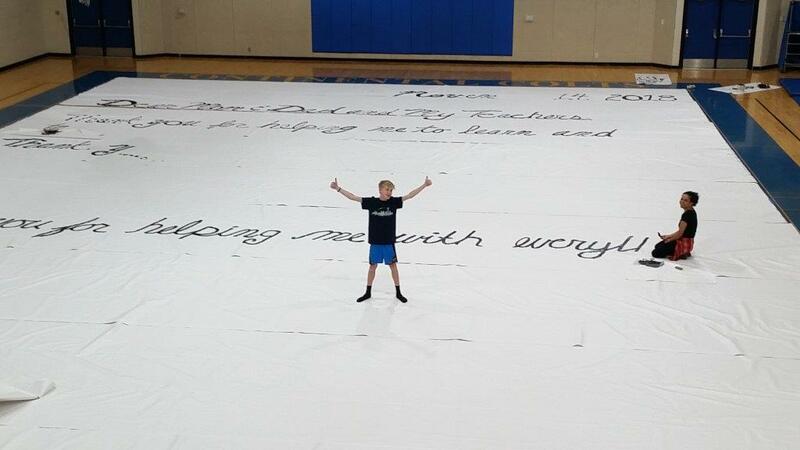 World Record Event: This is the first-ever Largest Thank You Letter and thus makes it a world record! To document the record, we will lay a 100-foot measuring tape next to the letter and videotape the length and width of the letter. We will also have signed affidavits from the superintendent and principal of the school attesting to the documented size of the letter. 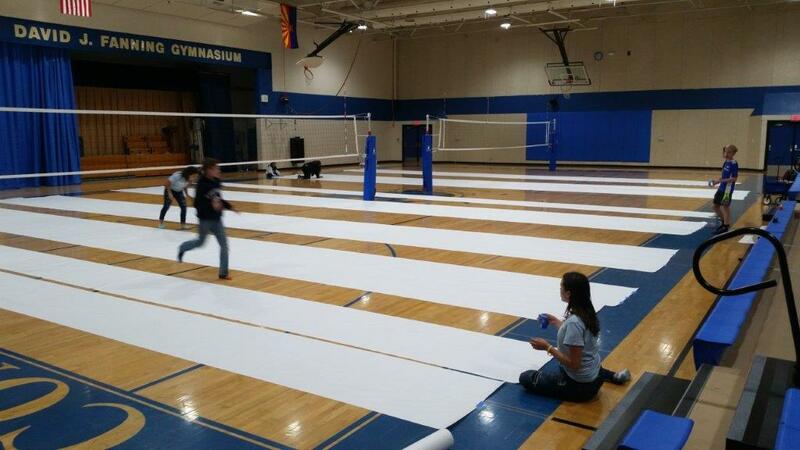 How: The letter will be one large sheet of paper comprised of rolls of butcher paper taped together. The handwritten letters will be painted in black paint. The thank you letter is addressed to the students’ mom, dad, and teachers, thanking them for everything that they do for the students. The letter is formatted as an actual letter with the date in the upper right-hand corner and begins with the salutation, “Dear Mom & Dad, and My Teachers.” The actual letter was written by students from the Continental Cursive Club. 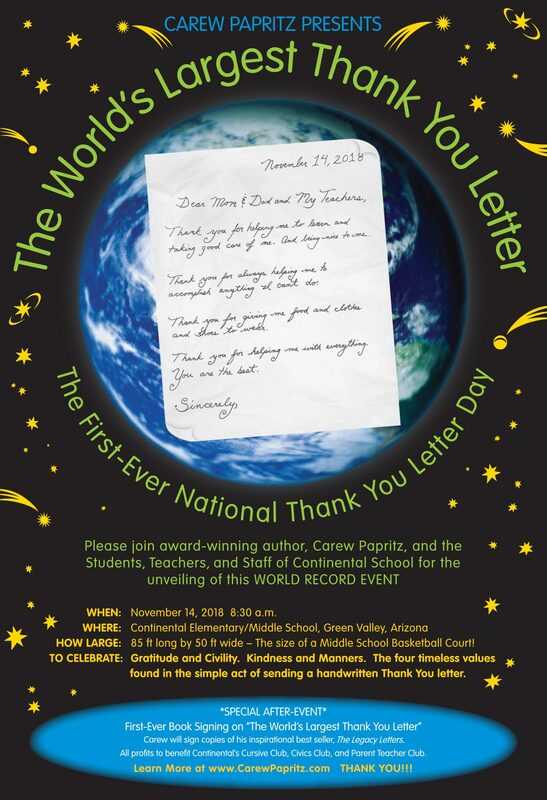 The inspiration behind the creation of the “Thank You Letter Day” and “The World’s Largest Thank You Letter” is taken from Carew’s award-winning inspirational book, The Legacy Letters. 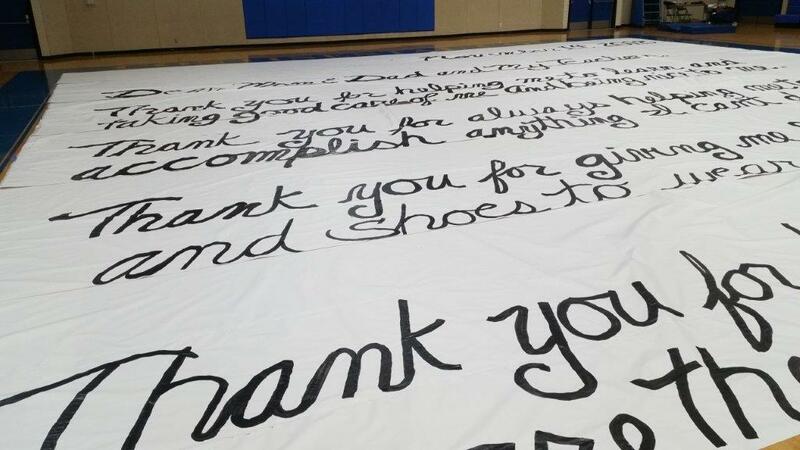 Carew took the idea from the pages of his book that talk about the importance of “Please and Thank You” and magnified it a thousand-fold by creating a giant handwritten thank you letter. For Cuba—Students gathered book donations from schools in three states then wrote personal handwriten letters that they attached to books. Carew then delivered the books and letters to children at a school in Havana, Cuba, helping to celebrate the new relationship with Cuba and the United States. Hurricane Harvey—Students collected donations of clothes and other needed items for fellow students during the aftermath of Hurricane Harvey and attached handwritten letters to the items, which were then sent to an elementary school in Houston that had been flooded. Carew truly lives the central theme of his book—to live life to the fullest—and inspires others to do the same. He love-of-life adventures include creating first-ever events such as signing books on top of volcanos and glaciers, on horseback and while river rafting. His adventures that inspire kids to both read and explore the world can be seen on his “I Love to Read” video series, which has garnered over a million views on his “CarewTube” YouTube channel. Carew believes in “paying it forward” by donating the profits from book sales to a designated charity during every first-ever book signing or community-inspired event. Charities include: Make-A-Wish Foundation, Military Mama Network, Reading is Fundamental, Seattle Children’s Hospital, Cowboys for Cancer, and many more . . .
During the “Big Thank You Letter” event, all profits from the sales of The Legacy Letters will go to benefit Continental School’s cursive handwriting program, the civics program and their annual trip to Washington DC, and the Parent Teacher Club (PTC). Carew has been a long-time advocate of cursive writing, speaking and writing extensively about the importance of teaching cursive in schools. He has been a big supporter of the Cursive Club at Continental School. Carew wanted the “Big Letter” to be authentic in its sound and intent. He wanted kids to write the letter. With the help of the Cursive Club teacher, Kathy Reiman, Carew had the students hand write thank you letters to their parents and teachers. Carew then took their actual words and sentences, which helped create the actual letter itself. Civics Club teacher, Wendy Fanning, had members of the Continental Civics club help construct the letter by rolling out the paper, taping it together, and painting the handwritten letters. 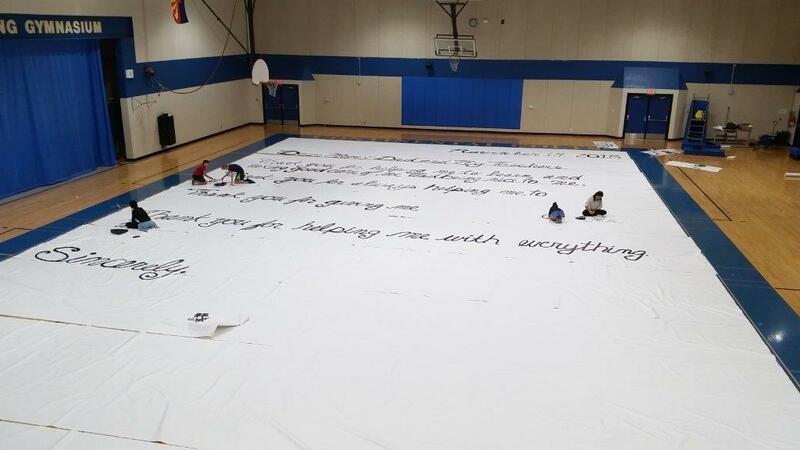 Continental School will celebrate National Thank You Letter Day on November 14th with the roll out of The World’s Largest Thank You Letter. The day before the assembly all 600+ children, teachers, and staff will sign the letter below the “Sincerely” at the bottom of the letter. On November 13, the entire school will, class-by-class, sign the bottom 1/3 of the Thank You letter (below the “Sincerely”). 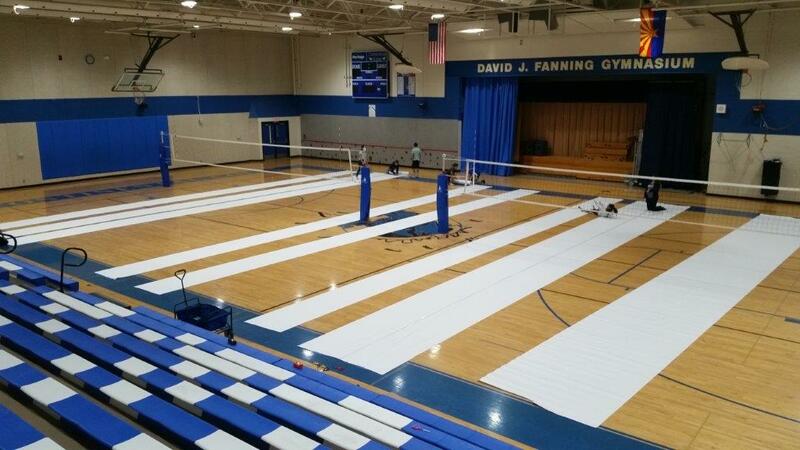 At this time, classes will go in order, from kindergarteners to 7th graders, to the gym to sign the letter. The 8th graders will sign the last signatures in front of the school at the assembly on November 14. 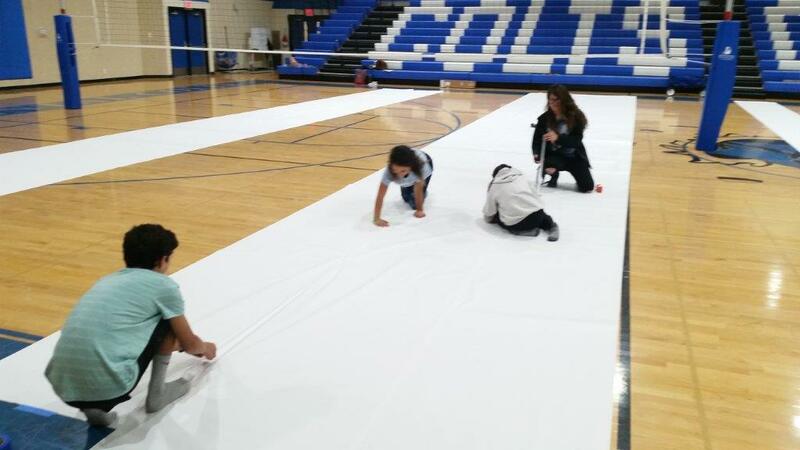 On November 14, the entire school will have an assembly to officially “roll out” the letter. A number of the school’s teachers and staff will speak to the importance of being thankful during the upcoming Thanksgiving break and promoting the school’s values of being kind to one another. 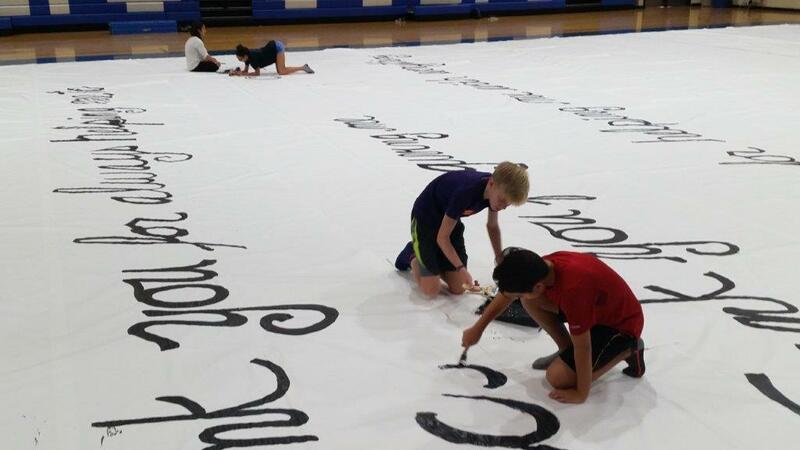 *A documentary of the making of “The World’s Largest Thank You Letter” will be available for viewing on November 14th. Thank you for helping me learn and taking good care of me. And being nice to me. Thank you for always helping me to accomplish anything I can’t do. Thank you for giving me food and clothes and shoes to wear. Thank you for helping me with everything. You are the best.